Timothy Hyde is "Australia's Magician of the Mind." A specialist corporate MC, sophisticated after dinner entertainer and expert in the field of Creative Thinking, he brings his magic touch to corporate events worldwide. Many of his clients have booked him on multiple occasions or use him for more than one role at an event. 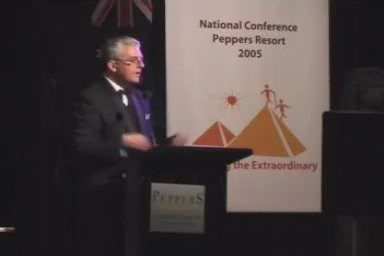 With a background in both education and innovative business and his years presenting in front of corporate audiences across the Asia Pacific region Timothy Hyde, is a dynamic and unique presenter who will change the way you think! Clients include - KFC, Pizza Hut, ASIC, Qantas, IBM and many large associations. More than a celebrity Timothy Hyde is a conference experience professional. Keeping events On Time & On Track, adding fun, energy and magic where needed, he makes events memorable, for all the right reasons. You want your MC to be entertaining and funny, you need your MC to be professional and articulate. Timothy Hyde is both and that's the reason he's been booked and rebooked by groups such as - AustBrokers / IBNA, ASIC, GDS International and the Association of Financial Advisors on multiple occasions. Timothy Hyde, Australia's Magician of the Mind, provides intelligent and astounding entertainment for corporate events. You've heard of Sleight of Hand? Well this is Sleight of Mind! Body Language, intuition & persuasion are combined to take your audience on an hilarious interactive journey of impossibilities. Easily staged, unique corporate friendly entertainment. What would it mean for your business if you were given the secret to unleashing a torrent of bright ideas using the resources you already have? If your people became motivated and empowered to solve problems and tackle challenges themselves? If you both discovered how to spot opportunities for business growth and improvement? With a background in innovative business, entertainment and pizazz as a professional magician and creative adult learning techniques, Timothy Hyde, Australia's "Magician of the Mind" will teach you to start "Thinking Like a Magician" Your audience will laugh, learn and be inspired as they are exposed to fresh new content delivered in an entertaining and captivating way, having a great time while they do it! Presented as a keynote or longer 'hands on' breakout activity or workshop your audience will learn simple yet powerful techniques they can put to immediate use in their own business and life. "You certainly exceeded my expectations and were the talk of the conference next day!" "I want to express my thanks to you for injecting the nuch needed humour and life into our CEO Event on the Gold Coast." "You made me and the company look good. Congratulations on a slick, professional and personalized presentation." I want to express my thanks to you for injecting the much needed humour and life into our CEO Event at the Gold Coast. Your sessions sure livened up the event. I am impressed with how you managed to weave our messages into your presentations and I have received compliments on how they added to our message.